Cookies! I love these cookies. They're kind of cake-like. 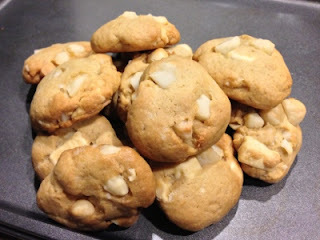 I've always loved white chocolate macadamia nut cookies, but the ones you buy from places like Bread Garden tend to be too sweet for my liking. That being said, I can barely finish one without feeling like a fatty. Sigh. I typically won't bake because I don't like baking. But for some odd reason I just kept wanting to bake a few months ago. That's when I went researching and learning how to bake. Cookies, in particular. Of course I came along THIS recipe. It's EFFING delicious! I actually followed the recipe the first time I made it. Well. That's a lie. Because I put in a little more chocolate chips than on the recipe. It wasn't too much sweeter though, since I used bittersweet chocolate chip instead of the semisweet variety. Since then, I've made my own little adjustments to it. I consider it a win since Hubby doesn't like sweets but he likes these a lot! Typically, I make them smaller (about 2 inches in diameter) so I don't feel as bad eating half a dozen of these in one sitting. Cuz you know. These are EFFING delicious! Lol! Combine the flour, baking soda, and salt into a medium bowl and set aside. Sift if you want, but I usually don't bother. Using a stand mixer fitted with a paddle attachment or a hand mixer, cream the butter and sugars on low speed until it is smooth and lump free, about 3 minutes. Stop the mixer and scrape down the sides of the bowl and the paddle. Add the vanilla and egg and beat on low speed for about 30 seconds, or until fully incorporated. Do not overbeat. Stop the machine and scrape down the sides of the bowl and the paddle. On low speed, add the flour mixture. Beat until just incorporated. Scrape down the sides of the bowl. Add the chocolate chunks and mix until they are just incorporated. If using a hand mixer, use a wooden spoon to stir them in. Refrigerate dough for at least an hour, preferably overnight. Preheat oven to 350F. Adjust racks to lower and upper thirds of the oven. Roll a tablespoon worth of dough into a ball and press into a 1 1/2 inch disk. Set on cookie sheets, an inch apart. Bake for 7 minutes. Turn the sheets front to back and switch racks and bake for another 5-7 minutes or until golden brown around the edges but still soft, almost underdone-looking, in the center. 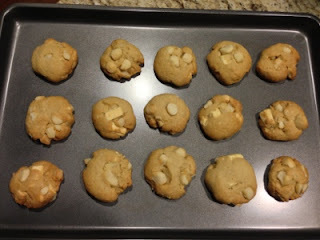 Remove the sheets from the oven and let the cookies set for about 5 minutes before removing them to a cooling rack. Wait at least another 5 minutes before serving or 20 minutes before storing in an airtight container for up to 3 days at room temperature. Best served with a tall glass of milk or some vanilla bean ice cream sandwiched between two cookies. If you don't have time to leave your eggs out to get it to room temperature, just put them in a cup of hot water for a few minutes while you cream the butter with sugars.